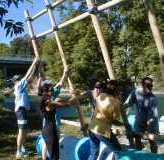 Raft building is our prime group activity. 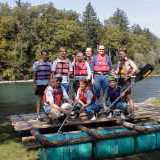 With special basic material and a coordinated working group, you build your own raft under comptent supervision. 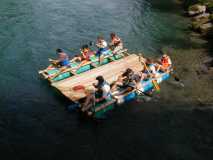 When the rafts are built, your trip on the Aare begins. Accompanied by a professional guide, you navigate the river from Kiesen to Rubigen. Im summer, participants can swim in the river and enjoy a beautiful landscape. - Unforgettable activity for companies, private groups, associations,etc. Wetsuit are recommended from a water temperature lower then 15 degrees Celsius. CH-3113 Kiesen, Wasenstrasse 1, parking spaces beside the bridge “Jaberg“. The walk from the train station Kiesen takes about 10 minutes. CH-3113 Rubigen, to the right side of the river after the “Hunzinken“ bridge. Please park your car in the parking space next to the restaurant “Campagna“ on the opposite side of the river. - Raft building takes about 90 minutes. - Aare trip from Kiesen to Rubigen takes about 90 minutes. - BBQ takes about 120 minutes. The activity could be cancelled due to seafty reasons.